finally got the car home and have been working on the interior.i ended up going with sem 15303 graphite.its a damn near perfect match.i bet that is what lmr sells for their charcoal interior color.plus,it fit the budget,i get for ten dollars a can.coverage took awhile.started off wet scrubbing them with a gray scuff pad and some standox plastic cleaner.prep cleaned them,and painted.took three cans to do both rear quarter plastics.thats including the speaker grates.these plastics are sun burned in some areas.im happy with the results. thanks! i havent tested these speakers yet,but i was the first person to ever peel these off the factory speaker covers.which i thought was pretty cool.is it worth saving these speakers?if their is a exact aftermarket option I would consider that. its on the seam where the firewall and floor pan meets.going to grind it down,seam seal it and por 15 over it,be fore I put the sound deadening over it. quick update.i have been working on cleaning up the dash.pulled the guage cluster out and noticed how faded the guages were.plus i have a new ford motorsport 140 speedo I want to install.i orderd the lmr guage resto kit and refaced them.worked great!pretty simple to do.i painted the needles also.a few things about the kit.the tach overlay doesn't have the highbeam cutout which was strange,but I was able to cut it out with a razorblade.and the needle paint leaked out in the bag it was shipped in but I ended up with more than I needed.overall very happy with the results.oh yeah,i did a new lens cover also. Last edited by kfxmatt; 10-27-2018 at 06:07 PM. The cleaned up gauges look fantastic, nice work. You've done an amazing job so far. Looks great. Gauges look great! Awesome progress, really love the way it’s turning out for you! have any of you guys use a vapor barrier behind the door panels?i bought the door panel insulation kit from lmr and saw they sell a kit for 87 and up.other than a speaker cut out,i dont see why they wouldnt work.id like to have the extra wind noise protection if i could.or would i be wasting my time? Looking really great Matt. I don't know about the door vapor barrier. When I reinstalled my panels, I just used gorilla tape to hold the original brown paper barrier in place. My plan if it was in bad shape was to use a heavy mill plastic. Mustangs Unlimited has the correct vapor barrier shields for the 79-86 cars. Just an FYI. Virtually all of mine have seen better days, so I plan on buying new ones. If you car is stored indoors and only washed occasionally you could probably forgo them, otherwise they are the only thing protecting the backside of the inner door panels from water damage. Good luck! Man! I looked high and low for those and never found them.i see lmr has 87 and up..for 21 bucks,what the hell.might as well do it.even though it will be garaged and only driven in spring and summer. For the price, especially right now as I believe they are on sale, they are a no brainer IMHO. You will spend at least 1/2 that on just regular 6 mil plastic to make your own. Good Luck! quick update.still plugging away on the interior.ended up getting the oxford gray carpet with mass backing from foxresto.great price.i ordered a seatbelt sleeve kit from them also.i have new door actuators installed,all door internals greased and sliding nice.door panel insulation kit and I ended up getting the vapor barriers.they are nice.required a little trimmimg and modding to fit nice.two door latches replaced.these have the extra brace on these?they seem to work fine.i painted all the interior plastics to match.installed a new stainless sunroof front retainer kit and got rid of all the old rusty hardware.hopefully this tightens things up a little and stops the leak I found in the sunroof.bought two new motorcraft dome light switches with the rubber boots for the jambs.next ill clean up the console. Sounds and looks like you are making good progress, Congrats! You don't say anything about the drains, so I will mention to make sure your sunroof drains are cleaned out and draining properly. That can lead to leaks and rust. Generally some compressed air blow thru them will do the trick. Good Luck! it was dripping from the bottom edge of this.now that I have new stainless retainers,hoping that helps.also would it be foolish to think about sealing it with something now? got alot done on the interior this weekend.put a new,used stock steering wheel in.installed carpet.new scuff plates are on backorder so i couldnt install those.new headliner is in! seatbelt where cleaned and polished and mounted in new sleeves. does anybody know where these two vacuum lines go? 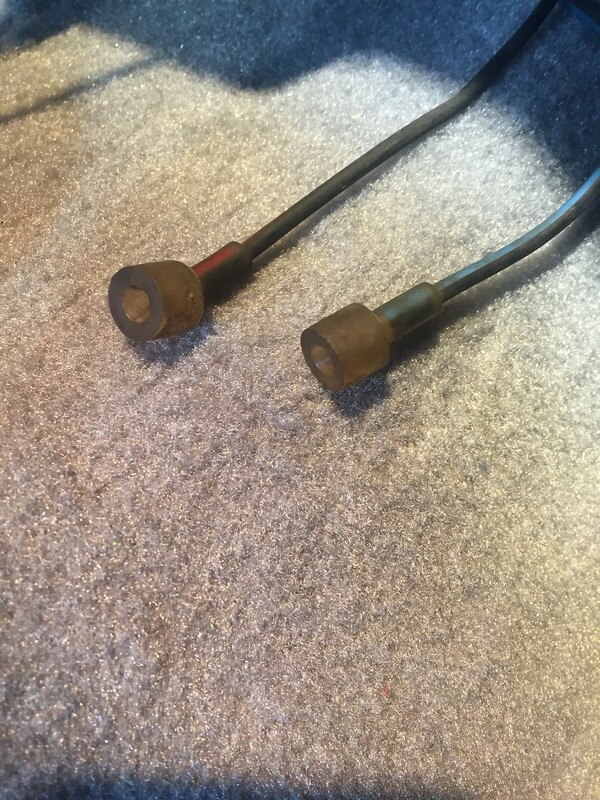 I for the life of me cant figure it out.the previous owner did a heater core and removed the dash,these are hanging from the passenger side and seem to go to the drivers side.. I believe those vacuum lines are for the blend door actuator. If I recall correctly, there's a vacuum actuator on the top left-hand side of the hvac box, closer to the firewall. Top side is red, bottom is blue. Last edited by snavesa; 02-11-2019 at 07:26 PM. Not the best picture for you, but you get the idea. I can try and get a better/closer picture for you either late tomorrow or Wednesday. Good Luck! Thanks fella’s!! Makes sense.i only have defrost at the moment..I gotta get under there and take a look. I’m assuming I have to pull the dash to do this?man two steps forward one step back..
You can try removing the front seats and laying down and try making it work that way, but odds are you may have to at least pull the dash out of the way enough to get to the HVAC unit. Good Luck!